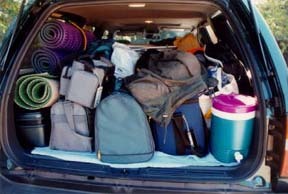 Our summer 1996 vacation was a trip through Oregon. We picked out the things we wanted to see and organized it into a trip down the coast then back up through central Oregon. 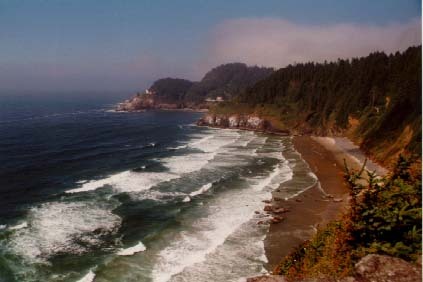 We drove down the coast, enjoying the amazing sights as we went. We stopped at Cannon Beach, flew our kite and had dinner at an excellent restaurant, Doogers. Of course we had to stop at the Tillamook cheese factory. The tour of the factory was very interesting, and somehow justified sampling the ice cream well before noon. Passing through Newport, we discovered the Oregon Coast Aquarium. The big attraction there is that it is now the home of the Orca that starred in Free Willy. The admission ticket includes a free serving of irony. 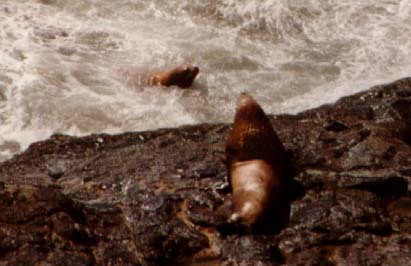 Further down the coast, we visited the Sea Lion Caves. 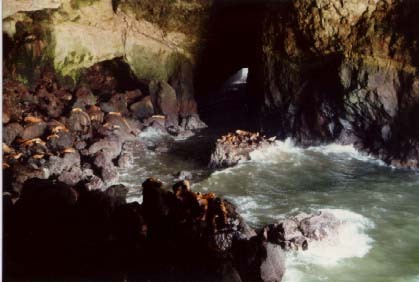 At the base of a 200 foot cliff is a sea cave that is accessible only from the sea, so sea lions hang out there. Of course, there's now an elevator so that tourists can observe the sea lions from an opening in the side of the original caves. 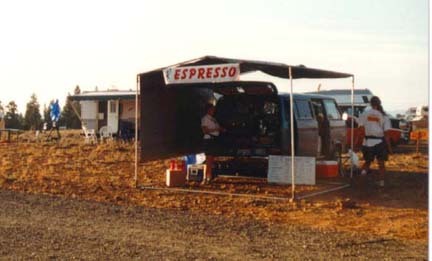 Next, we headed inland and watched the temperature climb from 60 degrees to 112 degrees. In Roseburg, we stayed at a very comfortable bed & breakfast, the House of Hunter. Just a few miles down the road, we found more animal adventures at Winston's Wildlife Safari. 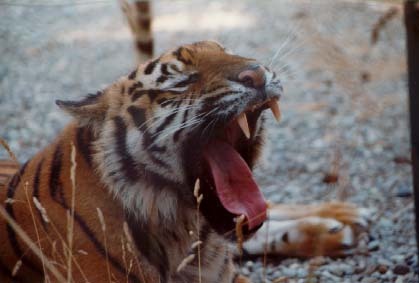 As its name implies, you drive through various compounds and see animals roaming around. In two of the compounds, you have to roll up all the windows, and convertibles are not allowed. The first of those compounds had several bears that were mostly sleeping through the midday heat, but the second had at least five adult lions, four males and a female. Several of the males were wrestling, which brought out the zookeeper in the Jeep to keep them from deciding to try to open a can of tourists. 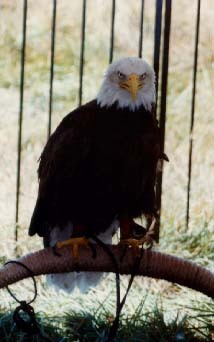 In addition too seeing the free roaming animals, we also watched a Birds of Prey show, and got a close-up view of a bald eagle. 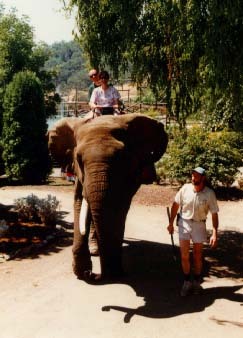 And, finally, in a fit of unabashed tourism, we rode an elephant. 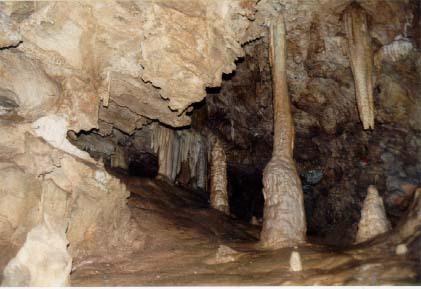 Not to be confused with the Sea Lion Caves, the Oregon Caves were discovered in the late 1800's by a man chasing his dog, who chased a bear into a cave. The caves are primarily composed of marble and were formed by flowing water over a period of hundreds of thousands of years. 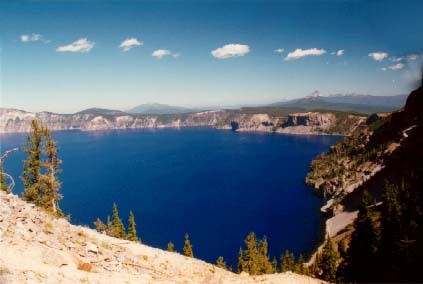 Crater Lake was formed just 7,000 years ago when Mt. Mazama, an active volcano of some 500,000 years, performed its grand finale in a colossal eruption that spewed out 42 times as much lava and ash as the 1980 eruption of Mt. St. Helens. Ash from that eruption was spread liberally through the western United States and Canada. From the literature, it wasn't clear if there were native Americans in the area at that time. What a sight that would have been. Following the eruption, the top of the volcano collapsed in on itself, reducing the elevation of the volcano by nearly a full mile and leaving a circular caldera about 6 miles across and half a mile deep. During the next 350 years, the bowl slowly filled with water, finally reaching a level at which the yearly rainfall is balanced by evaporation and seepage. This geologically very recent calamity created the deepest lake in the United States, at 1924 feet deep. Because the lake is isolated from other bodies of water and stays pretty cool throughout the year, it's relatively free of plant and animal life. There were no fish in the lake until the white settlers decided it would make a nice fishing hole. Of the six species introduced, only two adapted to the lake. Because of the deep, clear water, Crater Lake is shockingly blue. It's a deep bright blue that makes a clear sky look pale. The blue is a result of the optical properties of water. By refraction, the same phenomena that causes white light to separate into a rainbow of colors, the sunlight travels deep into the lake, and all but the blue light is absorbed. 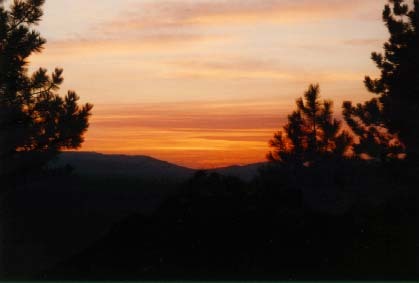 While we were rambling around central Oregon, several forest fires were burning their way through 90,000 acres. 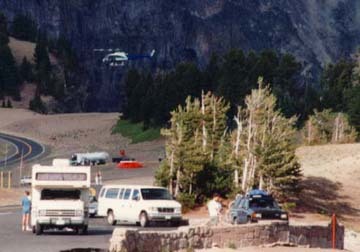 At Crater Lake, we watched a helicopter making continuous runs to douse some of the flames. 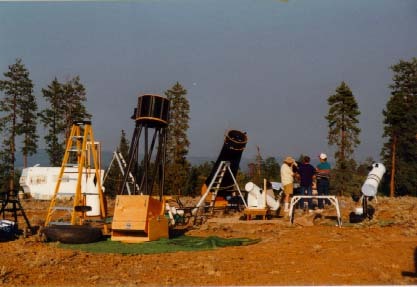 Later, at the star party, we couldn't see any smoke, but the brilliant red sunsets reminded us that the fires were still burning. 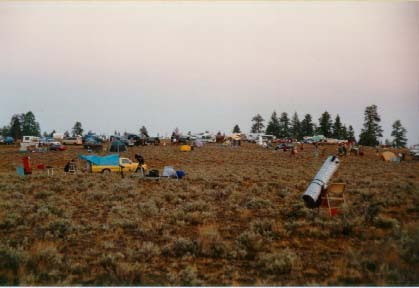 We camped in the Ochoco National Forest with hundreds of other astronomy enthusiasts and spent two nights looking at the stars against clear, dark skies.